When it comes to Jewish prayer, there are two schools of thought: keva and kavannah. Keva means "rote" and refers to the fixed prayers that are set forth in the siddur (Jewish prayer book), while kavvanah is the free and spontaneous inner devotion of the individual. Many Jewish youth groups and Jewish camps have tried to bridge the gap between the opposing principles of keva and kavannahby creating fresh and innovative prayer books for each service. For generations, Jewish teens, educators, and camp rabbis have spent hours photo copying prayers out of the standardized siddur and pasting them onto sheets of paper along with spiritual poems, catchy songs, motivational quotes, and clip art to make custom service booklets. The interweaving of traditional liturgical texts with hippie quotes and Debbie Friedman songs to create a specialized prayer book offers the keva of the siddur, but encourages the self-expression and spiritual spontaneity that is at the heart of kavannah. Now the market leader in pluralistic Jewish youth programming, BBYO, Inc., has launched a web-based application to design custom-made prayer books. Build a Prayer, which took almost two years to develop and is being funded through a Jewish Funders Network grant, offers every text imaginable, from Hebrew, English translation, transliterated, traditional, and pluralistic. Service creators can choose from pictures, poetry or commentary, and then share or print the service for use with their community. MyJewishLearning.com partnered with BBYO and provided the educational content about Shabbat and prayer for the online Resource Center that is built into the site. Build a Prayer isn't only for the teenage members of BBYO. Matthew Grossman, the organization's Executive Director said, "We hope Build a Prayer will be a valuable tool for the entire community; it is available to any organization, educator or teen who wants to produce creative worship experiences." After a guided tour of the Build a Prayer site by Michigan BBYO Director Eric Adelman, I played around with the many features and found it to be user friendly, interactive and intuitive. As someone who has created many custom prayer books and song sheets, and who likes a crisp, clean look, I really appreciated how professional looking the finished product turned out. To learn more about the concept of BBYO's Build a Prayer and to find out if the organization was worried that Jewish teens would miss the scissors and glue part of DIY siddur making, I posed some questions to Shayna Kreisler, the Director of Civic Engagement and Leadership at BBYO. 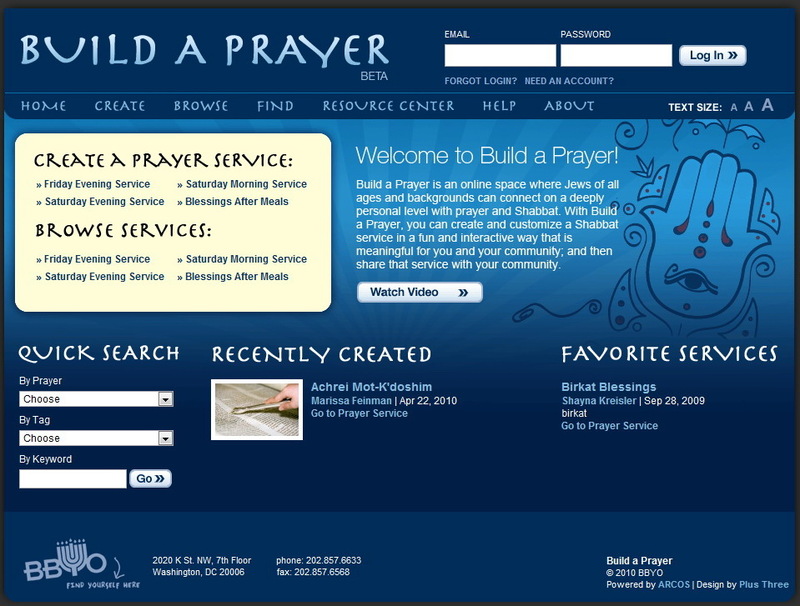 Who came up with the idea for the Build a Prayer site? The original idea came out of the observation that at BBYO, we see teens and staff members creating relevant and powerful Shabbat services, but also feeling challenged since most of them have only experienced services within their own synagogue. This challenge is made more difficult since most teens aren't comfortable in a traditional siddur – they don’t know where services start and end, what to include or what is "safe" to leave out. To meet that need, these worship services are typically guided by a teen-designed collection of songs, poetry and prayers that is compiled through an effort of photocopying, cutting and pasting together old song sheets and prayer book passages. As an organization, we saw the need to provide Jewish teens with an accessible place to explore prayer and its meanings – doing it online also happens to save some glue. Was there a "grassroots" push from teens to create this resource? I think that we were really responding to a need that we had been hearing from the field – BBYO, because we are not affiliated with a movement, does not have one single prayer book that we all use. Each region and community ends up making their own or creating new services for each chapter overnight, regional convention, etc. The teens that I work with on the International level were having issues finding the resources online, so while they did not know to ask for it directly, it was certainly a need that was being presented in the difficulties they were having in finding the appropriate resources. BBYO runs the website, but we work in partnership with other organizations (currently, The Foundation for Jewish Camp and MyJewishLearning.com) and are looking to build more partnerships around the website. We really feel that this is a value added resource for the entire Jewish community for a plethora of uses – independent minyanim, youth movements, day and overnight camps, b'nai mitzvah students, parents of b'nai Mitzvah who may not be as familiar with the Shabbat service as they would like, educators working with teens or other age groups, and more! What has the feedback been from teens? The teens LOVE it. We have received some really positive feedback about the resource and how it has changed the way that people look at the Shabbat Service. Eventually we hope to add in holidays, the weekday service, a haggadah, etc. Most of the feedback we receive is from people saying that the site is great and it would be amazing if it could do x, y or z. We take the feedback very seriously, and we are trying to respond to the needs of the community. I encourage anyone who has any feedback to email us directly through the website. Was there any concern that teens would feel nostalgic for the old-style cut and paste prayer books? The BEST part of the website, in my opinion, is the content finder. Once you start to build a Shabbat service, and choose your languages, the type of service you want to create and your prayers, you can start to add in your own poems, lyrics, translations, thoughts, videos, audio, images – almost anything really! And all of that info gets stored in the content finder for others to utilize. The more people add in their own content, the more rich the website becomes as a tool. We really look at that piece of the website as a way for people to share their thoughts and ideas and their creative work with the entire community. In a way, buildaprayer.org takes the scissors and paste concept and brings it into the 21st century. I really do not think that we lose anything at all – I think it really opens up the Shabbat experience in a whole new way. It is difficult to find a siddur that really fits an individual's or a community's needs completely, but with Build a Prayer it becomes much easier to make a custom fit prayer book that will encourage both keva and kavannah. On behalf of Jewish educators, youth group workers, and camp rabbis everywhere: Thank you BBYO! Maybe you can let them know and it can be fixed.